This is my crockpot, circa 1998. Most of my kitchen is stocked with items from 1994, the year I got married. This one is from the year I got divorced. It’s not the most modern slow cooker, and fellow party-goers make jokes about it, despite the exceptionally tasty meatballs I’m usually toting in it. I could get a newer one that would probably work better and be less “retro-chic,” but this one has sentimental value. My dad gave it to me. He’s been gone eleven and a half years now, and few things call him to mind as quickly as this old-school crockpot. My dad and I didn’t have the warmest relationship. He wanted four kids; I am Kid #5. I have no idea how old I was when my mom told me that, or why she told me, but my revisionist memory makes it seem as if I have always known this. What I remember most about my dad was him watching TV by himself in the family room. Sometimes he’d shout clear from one end of the house to summon me from my room on the other end, only to ask me to change the channel. He could be gruff, even taciturn. But when he was in a good mood, he was hilarious, telling us funny stories, sometimes pranking us or our mom. He teased a lot, and you couldn’t tell when he was joking. I was the sensitive one who’d get hurt feelings and run crying from the room, which would piss him off. No wonder our relationship was a little strained. Most of my childhood memories are hazy at best, and few of my dad remain at all. This one, circa 1977ish, sticks: I was sick in bed, in my yellow bedroom where the daisies from the wallpaper marched straight across the curtains. I don’t remember feeling sick, so there’s a high likelihood that I was faking it and my mom put me to bed to call my bluff, but I can’t be certain. My dad loved me, and I knew that. But like many fathers of his day, my dad’s chief role in the family was provider. The nurturing, daily kid management, and responsibility for creating happy memories was my mom’s arena, so she got most of the credit and most of the affection. She’d correct us, of course. “Thanks Mom and DAD,” she’d insist. Year after year, she’d have to remind us that the gifts were from both parents. She did the shopping, but his paycheck funded the bounty. Having lived most of my adult life as a single parent, I now recognize the financial feat required to raise six kids in Southern California. I remember money being a touchy topic, and I know sometimes my mom had to work miracles with the budget, but we always had what we needed and then some. I think now of all the years my dad went to work each day and came home to a house full of kids who needed shoes, orthodontic treatments, football uniforms, piano lessons, and of course, mountains of groceries. I know he didn’t get to enjoy much of his paychecks. I know how that sacrifice feels, and I appreciate him now in a way that I couldn’t when I was a kid. I know that sacrifice was an expression of love from a father that didn’t easily express love. The crockpot was another one. My marriage was rocky from the start. We were twenty-one-year-olds with a one-year-old son, trying to do the right thing by getting married. That struggle is a different story, but suffice it to say that of our four-year marriage, we spent two years in marriage counseling until, on the brink of a nervous breakdown, I finally gave up. He gave me away when I got married. Fortunately, he also took me back when I got divorced. “You just put it in the crockpot,” said my Dad, who seldom cooked at all. “I don’t have a crockpot.” I replied. The next time I went to my parents’ house was for my birthday dinner. My dad was unusually excited to give me my birthday present: this very crockpot. My mom told me that it was his idea to buy it for me. Other than the gifts he gave her, and even those he often had help shopping for, this is the only gift I can ever recall that he thought of himself, shopped for himself, and wrapped by himself. And he did that for ME. Kid #5. I knew he was worried about me, and what my life would be like as a single mom. I knew he was trying to make things easier for me with that thoughtful gift. My dad softened up as he got older. He and my mom went through some rocky times themselves, and in the process of healing his own marriage, my dad seemed to crack open. He learned to say, “I love you” to us, though it would choke him up to speak the words. He spent less time isolated in front of the TV and became more engaged with friends, church, all of us and his grandkids. I know that my kids remember this happier version of my dad, and I’m so grateful for that. When he was in his early sixties, a stroke took his balance. Later, a second stroke took his mind and mobility. Two years after that, in 2006, we said goodbye to him, all six of us with my mom together in his hospital room. That memory has not faded at all, but so many others are slipping away. It’s good to have so many siblings, because they keep different memories. Soon we’ll be old folks who tell the same stories over and over to help us remember. This crockpot story will be one of mine. Yoga. I never bothered to try it, because I assumed that a large, inflexible, uncoordinated woman with poor balance would not be able to do yoga. About a month ago, I finally gave it a shot. All my girlfriends were doing it, and I just wanted to be cool. Peer pressure caused me to experiment with yoga. I was correct. I can’t do it. And I love it so much, I wish I had tried it years ago. I didn’t realize that yoga is magic. When you require your body to attempt what it really cannot do for a good solid hour, until you’re sweaty and exhausted, your brain apparently winds up in some kind of crazy super-freedom state that allows you to think beautiful new thoughts. I can tell you that I must look ridiculous in my yoga practice, which is okay because I can’t see myself. I’m sure I never look like a warrior or a tree or a crow, but at the end of class, I’ll be damned if I don’t think like a yogi. This is good news, because my thoughts are kind of shaky these days. I’m still off-kilter from my recent breakup, and I spend a lot of time either sad, angry, or in a state of rigid avoidance. But for some reason, when I’m physically exhausted and instructed to clear my mind and focus on my breath, amazing thoughts radiate through my consciousness. I know I sound dramatic, but here’s what happened in my brain at the end of a recent yoga class. Thanks, body. You did great! Hey, feet. Thanks for the hard work. My feet are okay. They’re not weird-looking or anything and they never give me any trouble. I love my feet. You know, I actually love my whole body. Hear that? I love you, Body. I have an abundance of love! ….I have an abundance of love. ….I’m not afraid of being alone because I have an abundance of love. I really thought those things, all in a row, like popcorn popping in my brain. I was probably a little oxygen-deprived in that moment, because sitting cross-legged and bending forward like that causes the bulk of my belly to be crushed up into my lung-space, but whatever. It was worth it for that brilliant realization: I HAVE AN ABUNDANCE OF LOVE. The class progressed into the meditative portion, where you’re supposed to lie flat, clear your mind, and concentrate on your breath. So of course, that’s when my brain goes nuts. This “abundance of love” notion rolled right into a burst of clarity regarding my recently-ended relationship. While our relationship was good in many ways, it was always marred by possessiveness and jealousy. I’ve never had that particular problem before, and I didn’t get it. I didn’t understand why those problems kept surfacing, when I didn’t feel like I was doing anything to trigger them. I didn’t understand why we were constantly fighting over nothing. And right there in yoga class, it came to me. Abundance versus Scarcity. I have learned about abundance before, but I have always heard it applied to material things. An abundance mentality says that there is plenty for everyone. We can afford to be generous because there is enough to go around. Scarcity is the opposite of abundance. People who live in scarcity feel that there is never enough, and so they are constantly fighting for their share. I never applied the notion of Scarcity and Abundance to human relationships before, but BAM!—yoga clarity!—I suddenly saw how it works. I come from a big, loving family. I was raised with the certainty that I am loved. I have a great circle of friends. I have kids who love me. I recognize that I am extraordinarily fortunate to feel an abundance of love. I’ve never been one to feel jealous or suspicious; I’m very trusting. I’ve also never cheated on anyone; I don’t see the point—just love who you’re going to love. I have this crazy theory that almost all hurt feelings between friends are the result of misunderstandings, because I truly believe that people who love me would not intentionally hurt me. That’s what my life experience has taught me. Not everyone has had that life experience. I suppose if you were raised in an environment that was abusive or unstable, or if you suffered through abandonment or infidelity, you might feel emotional scarcity. You might feel like you need to fight for affection, guard it and keep it to yourself. Once you have someone’s affection, you might feel like you could lose it at any moment, and easily become suspicious or jealous. Suddenly all those fights, all that jealousy and possessiveness made sense. Why I felt so smothered, and why I felt like I could never do, or be, enough. We’re talking about opposite worldviews here. No wonder we couldn’t get along. That just took me 900 words to explain, but during yoga, it flashed into my brain on one big exhale, like I breathed all the clarity in and all the confusion out. I’m telling you– you gotta try yoga. Recall the Marvelous Moods of Meg? Sometimes they are chemical. Sometimes they are triggered by breaking up with a nice guy who loves you but does not inspire in you the passion you would really, really like to experience again in your lifetime (although it seems increasingly less likely as you approach your 40th birthday). Say you wake up with a terrific backache on the day you intend to execute this break-up and your beau, fresh from the chiropractor himself, lovingly applies the tens unit he just purchased to your lower back, because that’s just what kind of guy he is. Say you still do the deed, because you’re feeling increasingly guilty about playing along with the girlfriend routine when you can’t possibly imagine a future with this guy. Say he takes it like a gentleman, but reminds you before he leaves that although you may find someone you love more than him, you could never find anyone who loves you back as much as he does. Say you believe him, but you take the gamble anyway. Most likely, you are left with a backache and one hell of a bleak mood. Here is what I recommend. Take a lot of Advil. Numbly browse the For Sale ads on Craigslist. Try to imagine what you would have done with this day had it not been hijacked by your stupid love life. Meet the artist-girl seller in the Santa Ana Artist Village for the deal. 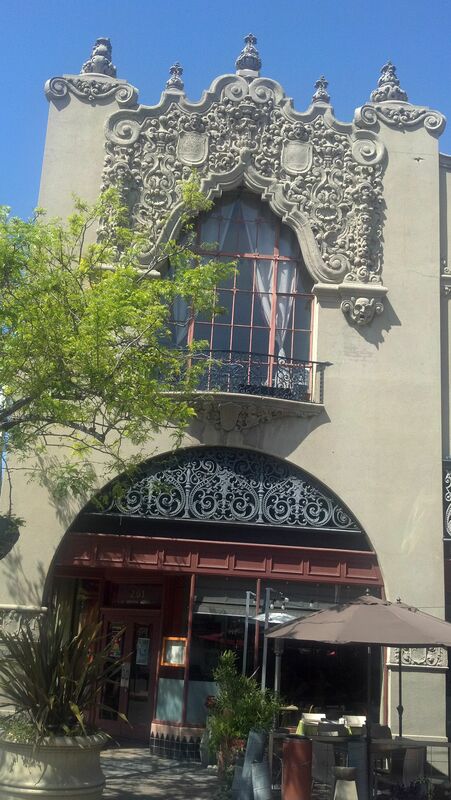 Wait for her in the warm afternoon and be inspired by the ornate façade of the Santora Building. Reflect on the fact that this same face has overlooked this sunny plaza since 1926. Be inspired by the artist-girl herself, with her Amelie haircut and bright-orange vintage bicycle. Ponder the possibility that your life might actually be some kind of movie and not real, kind of like The Truman Show. Stop on the way home for tequila. Painting alone might not be quite enough to handle this mood. Mix a margarita and set up the easel on your tiny, neglected patio. Choose yellow, red and white paint: guaranteed to make a happy outcome. 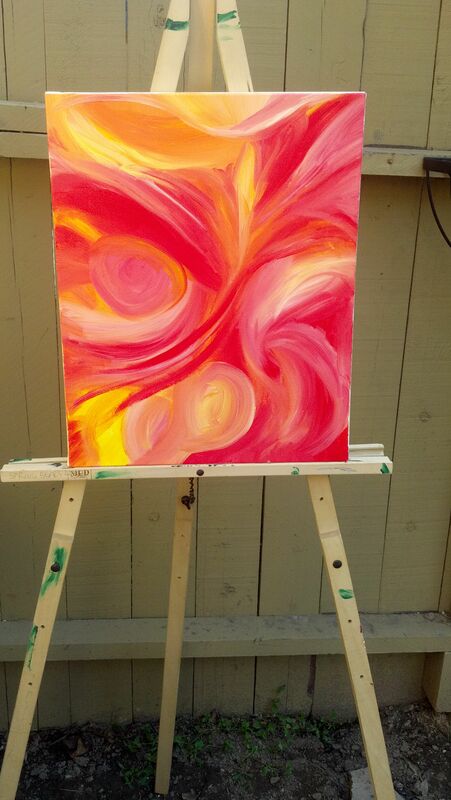 Be inspired by the orange and pink swirls. 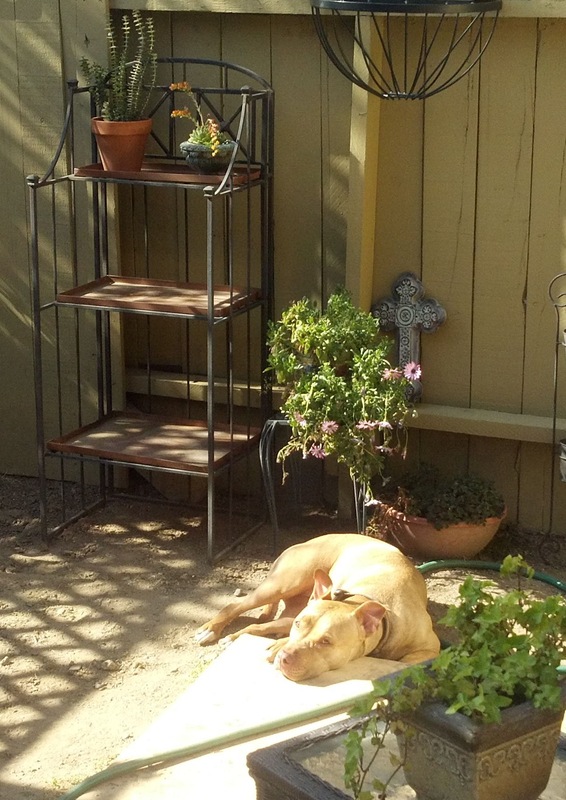 Be soothed by the dog sleeping in the sunshine.